I love Halloween, even as an adult. The biggest reason for my Halloween love is the fact that I can become someone or something else. The first thing you need are costumes, but the second part will completely finish off your look: face paint. When you paint a scary face, it’s very easy to scare young kids and even adults if you can get them by surprise. Here are some excellent ideas for Halloween face painting. What’s the first thing that comes to mind when you think of Halloween? If it’s a pumpkin you guessed correctly. Painting a pumpkin on your face is a fast way to get a Halloween face painting done. The easiest solution is to paint a small pumpkin on both sides of your cheek. Make sure it’s bright orange in color with a nose, a mouth and eyes painted in black. Use light grey for the ridges and the outline of the design. Another pumpkin face painting design would be to completely turn your face into a pumpkin. Use an orange base on your face and apply a darker shade of orange on your cheekbones. Than, draw a black triangle over your eyes and paint your lips and nose black as well. If a pumpkin isn’t your style and you rather go with something a little bit scarier, you could go with a skull design. This Halloween face painting design isn’t too difficult to create. Start with a white base that covers your whole face and use a bright red color for your lips. With a light grey paint you draw the outline of teeth on both sides of your mouth. Use smoky grey for the eye lids and exaggerate your eye brows with sweeping strokes in black color. Again, a very simple design to recreate, but if done correctly it will scare the living daylight out of everyone who sees you. The last design I have for you is the favorite of my son because it reminds him of Batman. Yes, you guessed it, it’s a bat! Just like with the skull design you start with a white base. The face of the bat is drawn in black above your nose and your forehead, with light grey for the eyeballs. Your nose will be where the body of the bat comes. Draw it with a couple of different shades of black. The wings of the bat will cover your eyes and mid-cheek. If you want to point out some details you could do that by using some light grey on the wings. It’s an easy design once you get the hang of it and it’s a big hit with boys who love Batman. These four ideas are great Halloween face painting designs to get you started. Once you become experienced you can try more difficult designs. While you can paint your own face, it is a little bit more difficult than painting someone elses face. Turn the face painting moment in a family moment by having everyone join in and paint each other’s face. But before you do, make sure you stock up on everything you need: face paints, paint brushes are a minimum and can easily be found on Amazon. 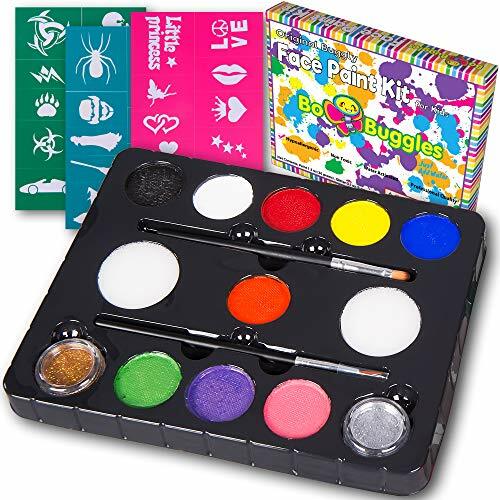 Professional quality, water-activated kids face paint kit with the same face paints as the Bo Buggles Pro face paint range. Safe even on sensitive skin. Simply the best face paint kit for kids available. 9 paint colors at 4g size for each paint (larger than other kits). Plus gold and silver glitter. 30 adhesive stencils that flex and follow the contours of the body and face for perfect application with no seeping. Each stencil will remain adhesive up to 3-4 uses. 2 quality brushes for thick and fine lines and details; 2 sponges for larger areas and working with stencils. Celebrate Halloween with your family and friends. Give life to this special occasion by doing some face painting. Just remember to wash the paint off your face before you go to sleep to avoid any irritations. Have fun this Halloween season by painting your face in different designs.